In an almost-destined move, Quaff Bros. — the Cincinnati-based barrel-aged beer collaboration project — will merge with Quaff On Brewing in Indiana. The creator of storied barrel-aged collaborations such as Blue Melvin went on to say that it works from a business perspective too. Quaff On was looking to start a barrel-aging project as it opens a new, larger facility in Southern Indiana. The new facility outside Bloomington houses a brewery, barrel program, distillery, and restaurants. From a logistical standpoint, it means that Gold will be able to set a timeline on collaborations and more efficient source barrels and work with breweries besides Quaff On. As for the current projects, Gold said he only has a few beers resting in barrels currently. Those projects haven’t maturated yet but information should be released once the beer is ready. “This will allow us to restart Quaff Bros. with a clean slate so we can start fresh,” Gold said. As for the awaited projects with the now-shuttered Blank Slate Brewing, Gold said they are deliberating what to do with those beers. “Obviously we don’t want to have to dump the beer, but we have to figure out the smartest move for everyone. Those beers also include Against the Grain Brewing, so we have to figure out the logistics of making it work,” Gold said. As for the merger, it will take effect almost immediately and will be “official” as of Saturday. The first big release for the combined project will come at the Festival of Wood and Barrel-Aged Beers, (FoBAB,) in Chicago this year. Gold said they are submitting a barrel-aged Russian Imperial Stout called “Fools Russian” — get it? Fools-Rush-In — as well as variants. He said the beers should be released to the public sometime after the contest. The change in business structure will also mean a change online, so fans should watch Quaff Bros. Facebook page and other social media for the latest updates. 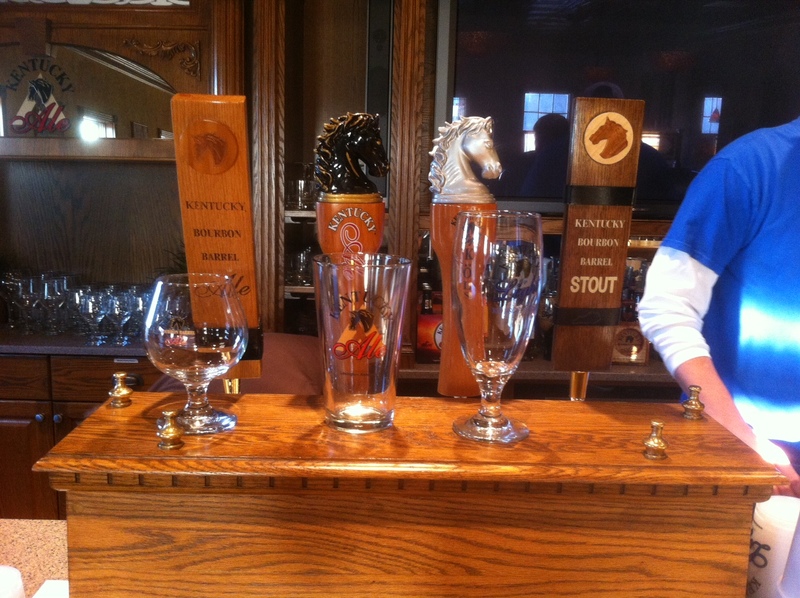 Kentucky Ale, and more recently, Kentucky Bourbon Barrel Ale, have been sources of Lexington pride for many years now. 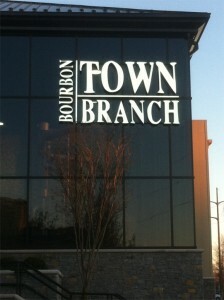 In fall 2011 the city was abuzz with the release of Town Branch, the first bourbon produced by the same company. That’s right, Alltech Lexington Brewing and Distilling Co doesn’t just make good beer. They are now in the whiskey business and they have the shiny new distillery to go with it. The beautiful new building is the first bourbon distillery to be built in Lexington for 100 years. The facility was opened in fall 2012 and it is already a popular stop on the bourbon trail if the line of people waiting for the 4:00 tour last Saturday was any indication. Last weekend Charlie and I were lucky enough to get a private tour with Tony, a tour guide and brewer with Alltech, as well as Nate-the-marking-guy who was there to make sure we stayed in line (and just maybe to grab a tasting for himself.) We got a tour of the grounds and then a chance to try all of the spirits that Alltech is currently selling: Town Branch bourbon, Pearse Lyons Reserve malt whiskey, and the Bluegrass Sundown, a coffee infused with bourbon and brown sugar. I will say that this was one of the better tours that I’ve done. It was the right amount of science, history, and alcoholic lore to make it approachable to the casual drinker as well as enough meat for those who already know a little more. 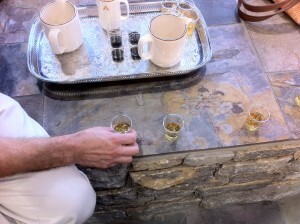 It was also worth noting that they give more of a tasting education than most distilleries. Tony took us in hand and firmly walked us through each step in the tasting, even slightly scolding me when I started to reach for my whiskey too soon, and gave us a lot of guidance on what to look for in the taste. An experienced taster might find the structure a little confining but for the majority of people who are going through the tour I think it would be helpful. The spirits were all presented in a way that makes them more approachable for the casual drinker as well. The whiskey was served with water, the bourbon over ice, and the Sundown was served with hot water and cream. As with the tour and the tasting experience, the spirits to seem to be aimed at the novice whiskey drinker. Town Branch is not a bad bourbon by any means. The nose was clean and light and it had a taste to match. Very smooth and mellow. Sweet with hints of vanilla and a light finish with very little burn. It is probably not a bottle that I would reach for on a regular basis but at a price point in the mid-twenties you could so worse, especially if you like a smooth drink with minimal heat. Likewise I enjoyed the whiskey but felt that they had favored cleanness and smoothness over flavor and heat a little too much. I was however quite smitten with the Kentucky Sundown. Strongly coffee in flavor with enough bourbon to make it interesting. The addition of the heavy cream made this a decadent after-dinner treat that I look forward to repeating again soon. After the spirits tasting we got to try the beer, something not normally on the tour, which is a shame because I think beer is really where Alltech shines. I tried their Kols-style beer, the Kentucky Ale, Kentucky Bourbon Barrel Ale and their brand new Kentucky Bourbon Barrel Stout. First I tried their Kols-style beer which was incredibly refreshing. Notes of citrus, smooth, and bubbly it was an almost champagne-like beer. It would be an excellent beer for someone who normally likes wine. I have enjoyed Kentucky Bourbon Barrel Ale in the past but I’d never had the Kentucky Ale and didn’t realize that the two were the same beer. Tasting the pre and post barrel aged versions of the same beer was one of the most interesting aspects of the tour. Both are very well-balanced and easy to drink. Finally, I got to try the coffee-infused Bourbon Barrel Stout. It was too heavy on the coffee for my taste but Charlie really enjoyed it. If you want to hear more about the experience and listen to Tony talk more knowledgeably about these drinks you can hear the spirits tasting in the drinks segment of Episode 57 of The Charlie Tonic Hour and the beer tasting will in Episode 58. I do highly recommend checking out the tour at Alltech. They have a beautiful new building and the staff were all super friendly, extremely professional, and very knowledgable. Lexington has so much to offer in the way of history, food, music, and culture and now they have a distillery right in the heart of downtown. What more could any city ask for?